What is Solvit Lightweight Bi-Fold Dog Ramp? The Solvit Lightweight Bi-Fold Dog Ramp is the lightest full-size ramp currently on the market. And though it weighs only 10 pounds, it can still support over 200 pounds. The all-plastic construction is designed to be durable and light, and as a bonus, it's easy to fold and unfold when you need to use or store it. The ramp has a safety release latch meant to prevent it from opening accidentally. 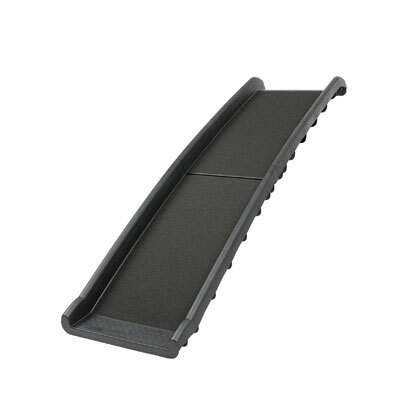 To help your pet feel sure footed and confident using the ramp, there are four rubber feet on the bottom to help the ramp grip surfaces, and its walking surface is made of a high-traction material. The Bi-Fold Dog Ramp is long enough when extended to help your pet easily reach heights of up to two feet. Position the ramp on the ground and on the surface your pet wants to get to so he or she can easily walk up the ramp rather than jumping or struggling to get up. The Solvit Lightweight Bi-Fold Dog Ramp is designed for use only by pets such as dogs, cats, and small animals. It is not intended to carry humans or heavy loads. Using the ramp in this way voids the warranty and creates an unsafe situation. Please follow this guideline strictly. When the safety locking strap is not engaged, it is possible for the ramp to swing open unintentionally. Always engage the locking strap when the ramp is not in use. When using the ramp in your vehicle, make sure your pet stays inside the vehicle until the ramp is deployed. Only then should you walk your pet down. The Solvit Lightweight Bi-Fold Dog Ramp should come packaged with the safety locking strap engaged (on side of ramp). To disengage, pull on the finger tab, which will remove the bulb end from the opposite ramp piece. Set the angled, lower surface on the ground. Fold it into the closed position. Engage the safety locking strap. Stow in a convenient place. To protect your pet's safety, make sure the rubber feet on the upper and lower ends of the ramp are resting firmly on a stable surface (car bumper, sidewalk, etc.) before using. If the rubber feet are not in contact, the ramp could shift during use, risking injury to your pet. The Solvit Lightweight Bi-Fold Dog Ramp is designed for use only by pets such as dogs, cats, and small animals. It is not intended to carry humans or heavy loads. Using the ramp in this way voids the warranty and creates an unsafe situation. Please follow this guideline strictly. Many pets will begin using the pet ramp with no hesitation. However, if your pet is unsure at first, you should be able to train him or her to be comfortable using it. Lay the ramp flat on the ground, and allow your pet to become comfortable walking on it before using it in an inclined position. It may help to hold your pet by the collar and offer praise, reassurance, and/or treats as your pet gains confidence using the ramp. If the plastic parts of the pet ramp get dirty, clean them with any standard household cleaner. The tread material can be cleaned with mild detergent and a stiff brush or a strong jet of water. 62" x 16" x 4"